If you notice a problem in the hall, please note it in the Maintenance Book which is kept on the cupboard by the Rectory Lane side entrance and is checked regularly by the Caretaker. 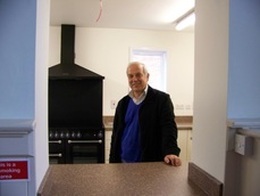 Saltwood Village Hall's Caretaker looking through the hatchway of the new kitchen into the Meeting Room. It is overlooking the green in the heart of Saltwood, right on the junction between Grange Road and Rectory Lane. Click on the picture to enlarge it. 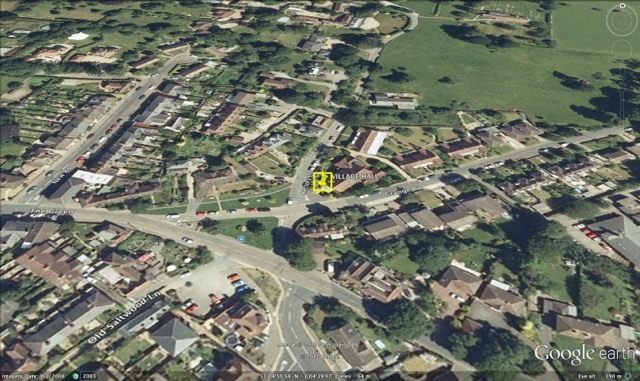 It is an aerial view of the heart of Saltwood showing the village hall at the junction of Rectory Lane and Grange Road.